Aqua (Water), Magnesium Aluminum Silicate, Propylene Glycol, Phenoxyethanol, Methylparaben, Propylparaben, Butylene Glycol, Enantia Chlorantha Bark Extract, Oleanolic Acid. Go beyond extending makeup wear to address the root cause of why your makeup moves. This formula specifically targets oil-prone areas and acts as liquid blotting paper to leave your skin fresh and matte all day. Use alone, before, or after foundation for long-lasting control of excess oil, while minimizing the appearance of pores. Can also be used throughout the day to touch up areas of concern. Prep & Prime Eyelids: Warm a small amount between fingertips and pat on to eyelids for 12-hour oil control and to prevent eyeshadow slip. Liquid Blotting Papers: Warm a small amount between fingertips and pat over makeup to touch-up oily areas throughout the day. The best primer for oily skin!!! This is the only primer that has ever kept my face matte all day. When I use it, I emulsify the product in between my fingers and PAT it into my skin (I'm oily all over, except under my eyes). I've learned that rubbing the product will only make it cake up and roll during application). Don't put it on areas that aren't oily though, you may have cystic breakouts because of it. I also place this over my makeup when I'm done, and keep it with me to reapply (pat) it on throughout the day. I've also placed it on top of lipstick to make it matte :) I love this!!! This is one of the VERY few effective primers on the market that doesn't contain a load of silicone -- in fact, it doesn't have any. Silicone primers are excellent at creating a super ultra smooth look (nice if you have acne or scarring), but if you're sensitive to them they can also cause breakouts (not so nice if you have acne). I'm breakout-prone with oily skin, and the two times I tried a silicone-based primer -- a Smashbox and a Laura Mercier -- I got the most horrific cystic face-freakouts of my entire life. Absolutely no pimples incurred from this one, and I've been using it (sporadically, because I'm lazy) for a couple years. Will this give you that perfect airbrushed look you get from heavy-duty primers? No. But it DOES blur large pores and fine lines to some degree, and it definitely helps mattify the skin, and it definitely stays in place. I've used it under a few foundations -- Clinique Even Better, Guerlain Lingerie de Peau, and Algenist's tinted moisturizer -- with no pilling or other problems with any of them, as long as I pat it on rather than rubbing it, and let it set a minute before applying foundation. This is thee best primer for oily skin! I've been using this Becca primer for about a year now, tired some other options & came right back to this! I have very oily skin & this is the only primer that I've found that helps control my oils for hours! I would most def recommend! 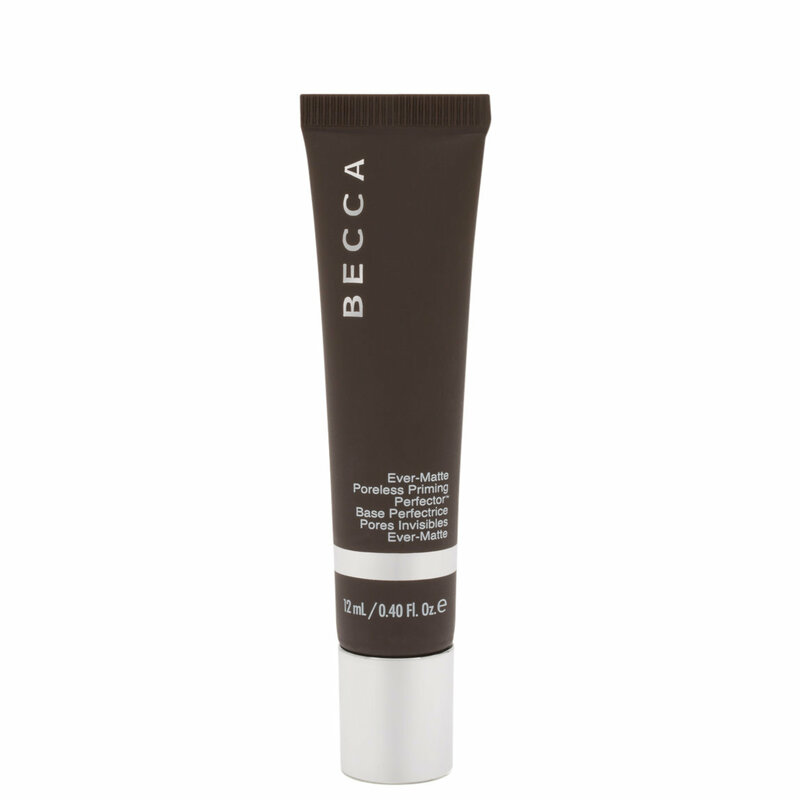 I ordered this primer with the Becca ever matte foundation. Put it on the right way (patted it onto my t zone) and waited for it to dry COMPLETELY. honestly. As soon as i applied the foundation - which i did not cake on since it's supposed to be so matte- i looked closely in the light and boom, there werw crusts of foundation patchy as hell EXACTLY where i applied the primer. My skin is combination. I moisturize religiously, i take care of my skin, and this should not happen. I would not recommend it. Haven't tries with any other foundation, only with the foundation you're supposed to use it with, the Becca ever matte. I do quite like it, though once i finish it up i won't repurchase it. I does make me matte and helps to keep my foundation on, but it does accentuate pores which i never really noticed i had before trying this. Hasnt broken me out after using it for a month. All in all, i'd give it probably 3.5/5 stars. Matte? Yes! This kept my oily face so matte, and even almost made it dry out! Poreless? Not really, I still had to use another pore product to reduce the appearance of mine. I have extremely oily skin and this stuff is a miracle worker!!! I have tried so many primers that claim to work for oily skin, and this stuff keeps me matte for the majority of the day! I only have to powder or blot once halfway through the day where as I would normally have to blot or powder 3 or 4 times a day! My only complaint is that it can ball up if you use too much or if you don't let your moisturizer set long enough. You only need a very small amount and I only use it on my t-zone to help prevent it from balling up. Overall I love this primer for its mattifying capabilities and how it makes my makeup last all day long!! If you have oily skin, you NEED this primer!! First let me touch on the primer itself. I finally had a chance to try it out today while doing my makeup. It felt really nice as I applied it to my skin and did not ball up which is always a plus. My foundation applied smoothly and looked beautiful. I wore my makeup all day and I would say my T-ZOne did good with no oil for a good three hours. I did have to blot after that but it still looked really nice. I really enjoyed the primer. The reason why I gave this two stars is because the bottle was really empty. It felt very light but when I held it up to my ring light I was shocked to see that almost the whole tube was empty. They basically fill it up less than half way which was a huge turn off considering it was not cheap. That is my only con with the product. When I buy other primers, the bottle is never completely full but it has a great amount. This primer, almost empty. For the price, that was not worth it to me.